The 29 metre high round tower is situated in the south west corner of the enclosure. The capless top of the tower is battlemented. It has 7 windows and a doorway almost 2 metres above the ground with moulded framing. It is believed that St Rhuidche (pronounced Ree) lived here, but no one knows when the monastery was actually founded. We do know the lands were the property of the Dean of Ossory until the 13th century when they were transferred to the Priory of Kells which is situated 2 miles north of here. The tower and church are located in a walled cemetery that sits in a large field. 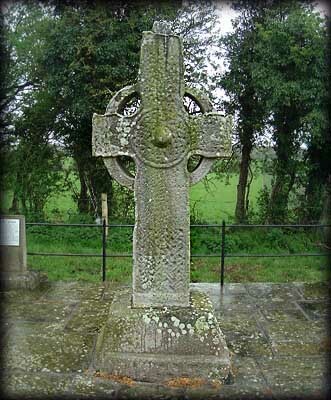 There is a High Cross, pictured below, on the far side of the field 50 metres south of the round tower. The cross is believed to be of the 9th century. It is a badly weathered sandstone cross standing at 2.75 metres high covered with bosses and geometrical motifs. The east face bears a hunting scene on the arms. The ends of the south arm also bear some figure sculpture. On the west face is probably a panel depicting the Adoration of the Magi and maybe Daniel in the Lions den. There is a tenon joint still visible so more than likely the cross was fitted with a capstone. Very little is known about the history of the medieval church. It is a large nave and chancel church with antae at the western end. The chancel was added later. 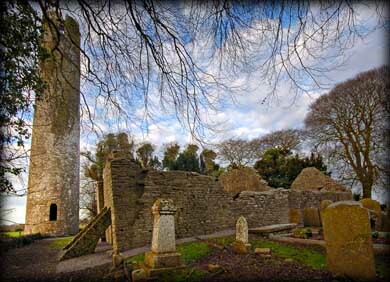 Situated: From Kilkenny take the N10 south to Stoneyford, take right turn for Kells, at Kells keep left, after two kilometres you should see the round tower in a field to your right. The cross stands 150 metres behind the tower. Sometimes there are bulls in this field so please check before entering. Discovery Map 75: S 4968 4123. Last visit March 2011.